Hanging above the rock garden the Chilean lantern tree takes a few years to get established, and needs a bit of space when mature to be at its best, but it is well worth the wait. If you have not seen one before, it will grab your attention immediately. 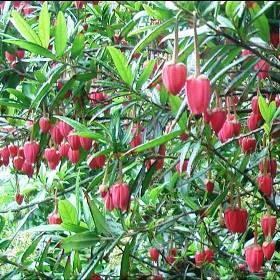 Introduced from Chile in 1948, it bears eye-catching, crimson lantern-like flowers, each suspended on a long stalk, hanging among neat, dark green leaves. The flowers are dangled in mid-air for the humming birds to pollinate. Grow in well drained but moist soil which is fertile, humus rich and acid, in either partial shade or full sun. If in full sun, keep the roots cool and shaded with under-planting. Shelter from cold drying winds is essential.